The climb involves mostly 5.4 moves with one short 5.6 fingers crux. This is a good step up from Knapsack Crack and definitely easier than Deception. 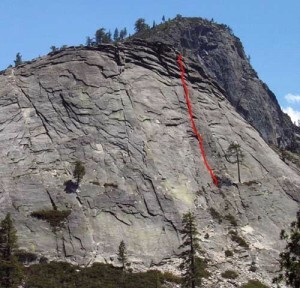 Near the top, either climb a 5.7 mantel or make an easy face traverse right. Which SuperTopo guidebooks include a topo for Harvey's Wallbangers, Center?